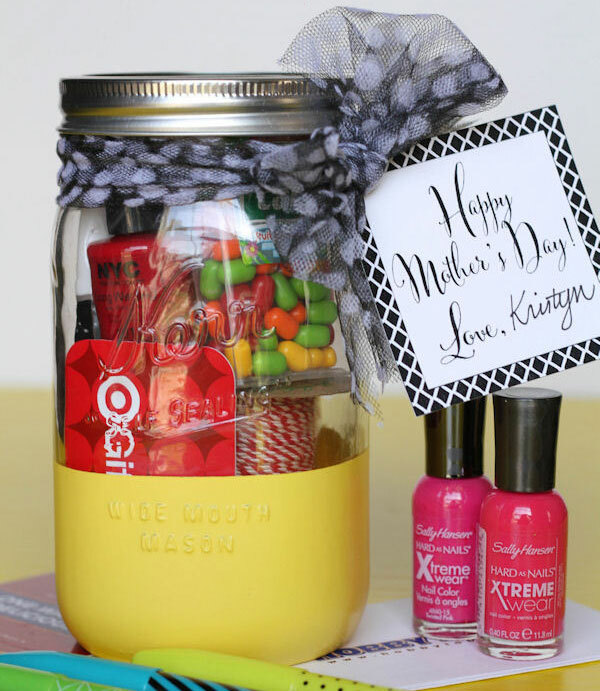 Mother's Day 2015 - your ultimate guide to DIY gifts! 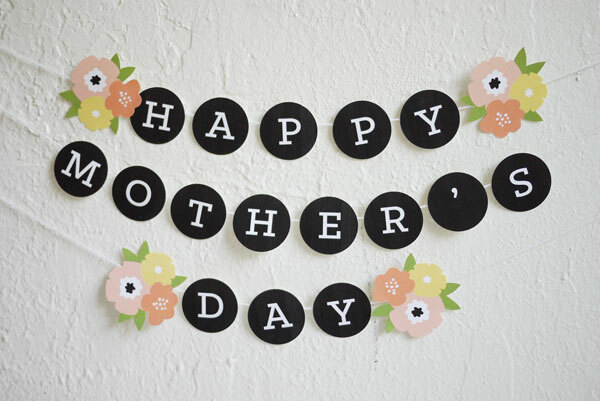 Mother’s Day 2015 – your ultimate guide to DIY gifts! Sometimes some of the most treasured gifts are not the ones that cost lots of money or are shop bought. Gifts made with bucket loads of glue, effort and a hefty dose of love always come up trumps on Mother’s Day. 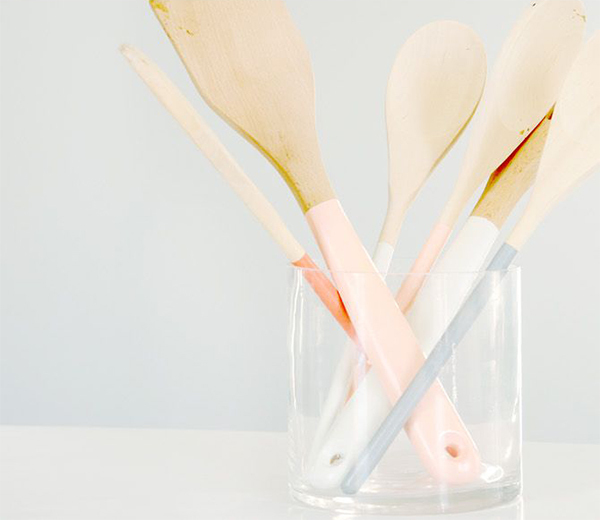 It’s without further ado that I present our top ten DIY craft ideas to gift your mum, aunt, sister, nanna – even yourself – this Mother’s Day. Fresh flowers from the garden are made all the more sweeter when presented in a pretty vase. 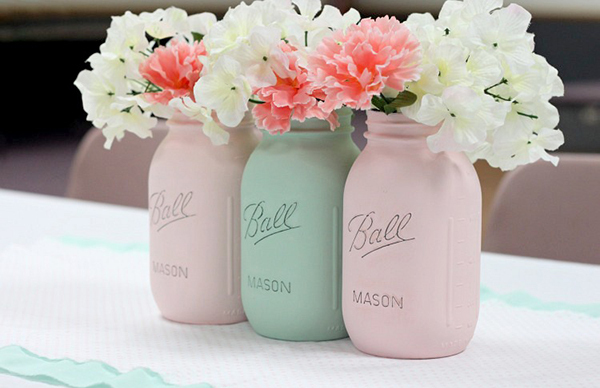 Painted mason jars are perfectly pretty all lined up in a row and make a gorgeous table arrangement at the same time. Love of Family and Home have a full, easy to follow how-to guide on how to paint your own mason jar vases – the hardest bit is deciding on colours! Coffee scrubs are big business at the moment, they smell divine and are amazing on the skin and it’s also a whole lot of fun to make! Package it up in cute personalised jars for the ladies in your family, or bag it for yourself. 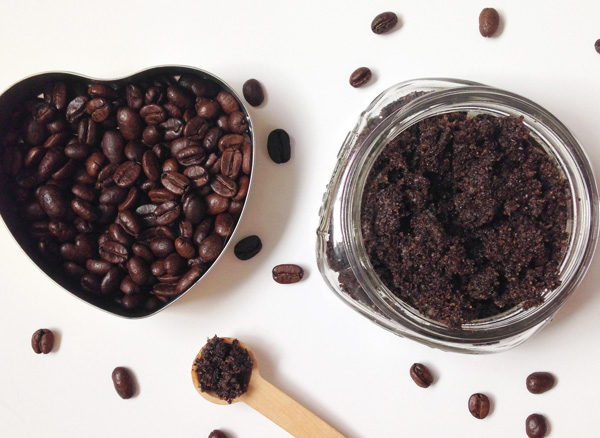 A recipe (no you can’t just empty your coffee machine) for Vanilla Coffee Sugar Scrub can be found over at Dawn Nicole blog. If mum loves a touch of bling but the budget doesn’t extend to anything too flashy, this is a gorgeous idea to fit the bill – in a roundabout fashion. 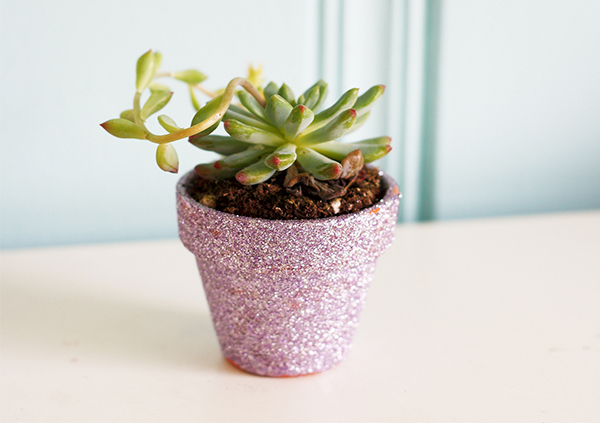 Head to your local garden centre for a terracotta pot (or three) and an easy to care for plant and prepare to give it some serious razzle dazzle as seen here on The Pretty Bee blog. 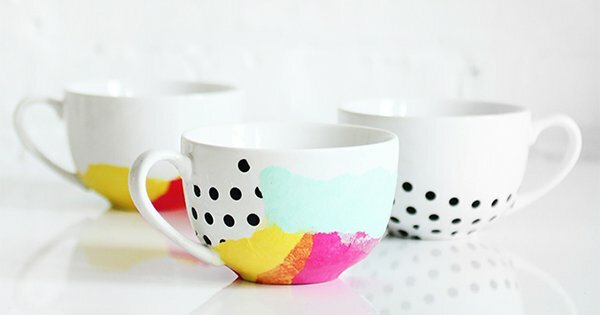 The current trend of all things paint dipped is much loved by many. The good news is that it’s a trend that’s super easy to recreate at home and Earnest Home Company blog shows us just how. I adore this stylish cutlery set and glass pot (easily sourced at Kmart or Big W) and you only need a few extra materials to get the job done. 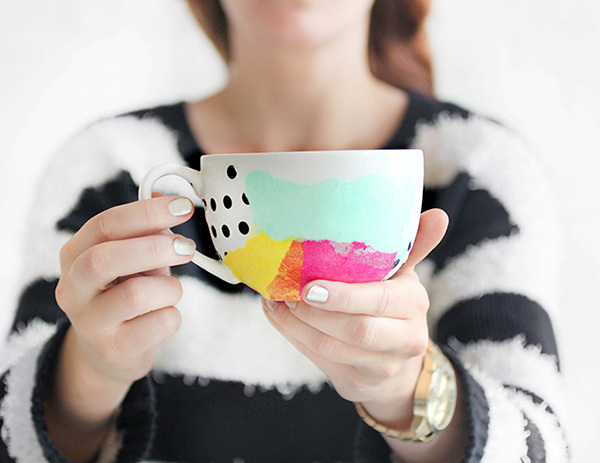 For crockery with individual fair, even if just wanting to create a really special cup for mum’s cup of tea, there’s no denying the awesome look of this gorgeously bright Tissue Paper Watercolour Mug. It’s super easy to achieve and lucky for us (me) there’s a full tutorial on how to create your own over at I Spy DIY blog. Tea drinkers will get a warm fuzzy buzz from making a gorgeous cuppa with a carefully hand crafted brew! 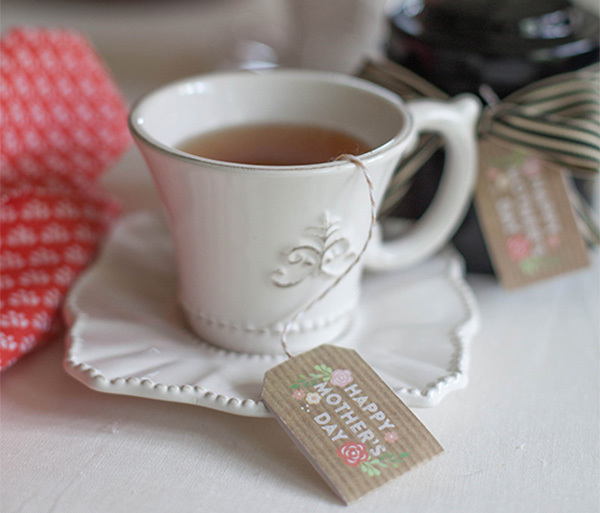 Free tea bag tag printables from Lia Griffith make creating your own crafty touches to a Mother’s Day morning tea a cinch. Young children will love to get busy recycling egg cartons to create a colourful bouquet canvas for mum, lasting much longer than a real bunch of flowers, it’s also an activity to keep the kids busy for the day! For a full list of instructions and equipment, head on over to Modge Podge Rocks. Kids always love to dabble in paint, and who would have thought a lemon could make such a gorgeous paint stamp? 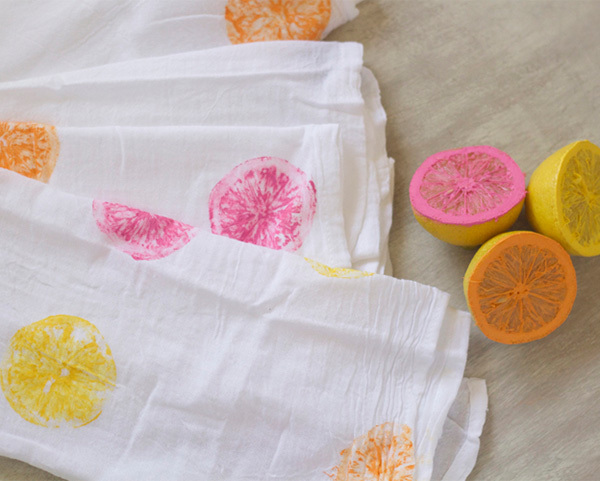 Make a set of pretty citrus decorative tea towels (or even a matching apron) using this clever tutorial from the folk at Making Home Base. A fantastic last minute gift for mum is a Mother’s Day In A Jar – fill a jar with mum’s favourite things for her to enjoy, print off a fancy Lil’ Luna label and don’t forget to add a couple of sweet notes of appreciation! If you’re holding a morning tea or lunch for the mums in your family, a perfect way to tizz up the table is with the Mother’s Day Banner and Party Kit, a free download printable file from Oh Happy Day. It’s as easy as hitting the print button on your home printer and cutting them out! 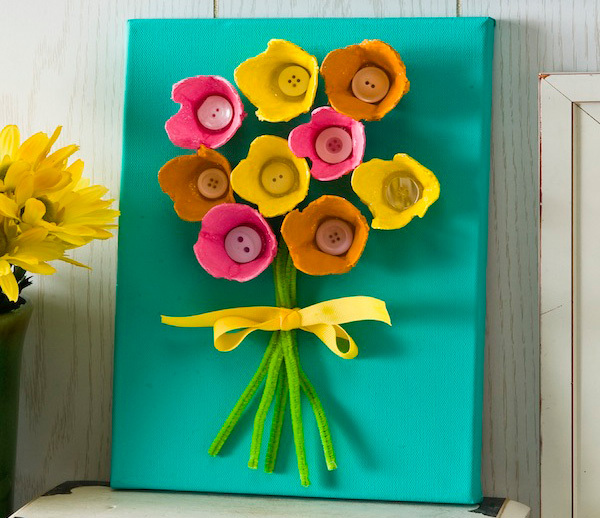 Happy Mother’s Day crafting, and make sure to check all our Mother’s Day 2015 gift guides for more fab ideas.